I live near Chattanooga, TN which is known as the scenic city for a good reason. It is such a beautiful city with great views, landscape, hikes, architecture and scenery. I started my list immediately of places to adventure. Once I had my list of 30 places, each day I would choose my adventure based on the weather and my time available. I added a few places to my list as I went as I was encouraged and inspired by others. I did all of these adventures while maintaining my full time job, part time photography job, a home, and my marriage. I was lucky enough to have family and friends join me on some of my adventures and made new friends along the way. To make it even better, all of my adventures were free other than gas and parking at a few state parks. Being mid summer, most of my adventure hikes were to waterfalls. Worked out for me, as I am obsessed with finding new waterfalls and returning to old ones. I also have a love for long exposure photography. Caution: Many of the places I visit have had fatalities due to carelessness. Be very responsible if you are going to be hiking near cliffs, ledges, waterfalls, and creeks. They can be very dangerous but if you are careful and respect the scenery the views can be so rewarding. Also, a hike I may consider easy you may find not. Do not hike beyond your capabilities. I tried to consider the average person when describing my hikes. Adventure 1: Sunset Rock on Lookout Mountain. Somehow I have never photographed a sunset here and knew it belonged on my list. 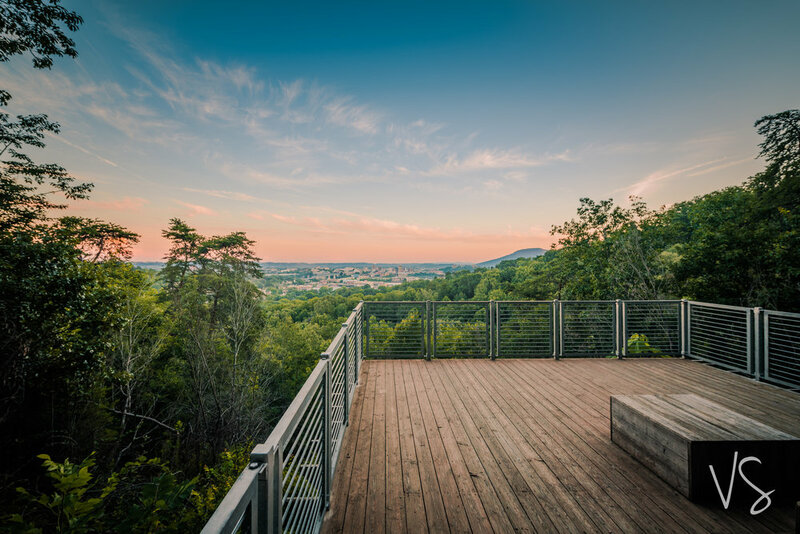 This spot provides spectacular views from the bluff of Lookout Mountain stretching towards Chattanooga. You will also see the TN River wrapping around Moccasin Bend and Tiftonia. You can count on rock climbers to be climbing the cliff below you when it’s good weather. You can also count on watching the sunset with several others especially on the weekends. The hike is only .1 miles if you can manage to park in the tiny parking lot off of West Brow Rd. Otherwise you can hike from Craven’s house for a 3 mile round trip hike. Either route you take is well worth the trip. Adventure 2: Downtown Chattanooga, TN. I used to live 5 minutes from here and would come often. Living 30+ minutes away I don’t get down there as often as I would like. Coolidge Park, Walnut St Bridge, Market St Bridge, The Hunter Museum, Glass Bridge, and Renaissance Park were my areas of focus. I love how photogenic this area of Chattanooga is. You’ve also got the aquarium area, the river park, and the pier on the other side of the river. If you go at sunset you will see the Southern Belle returning home from it’s cruise. Adventure 3: Rainbow Falls. This is a majestic waterfall that I have heard dozens of times from passing up above it hiking around Signal Mountain. 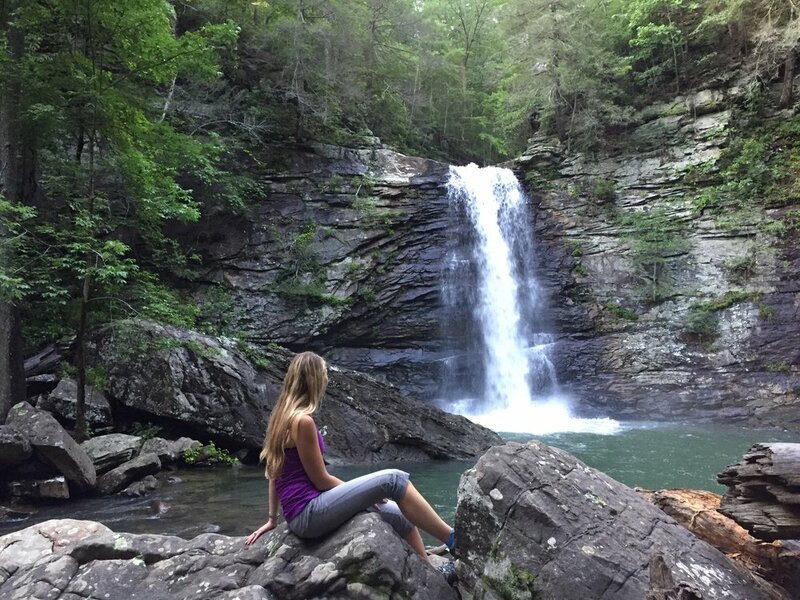 I had inspiration to find the waterfall from an Instagram friend who had been and happened to be available to show the way this day. The hike down is off a steep cliff where every step must be taken with caution. It is a very rewarding trek if you are capable of getting down though. You can get to rainbow falls 2 ways. You can park and hike from Signal Point or Rainbow Lake Trailhead. 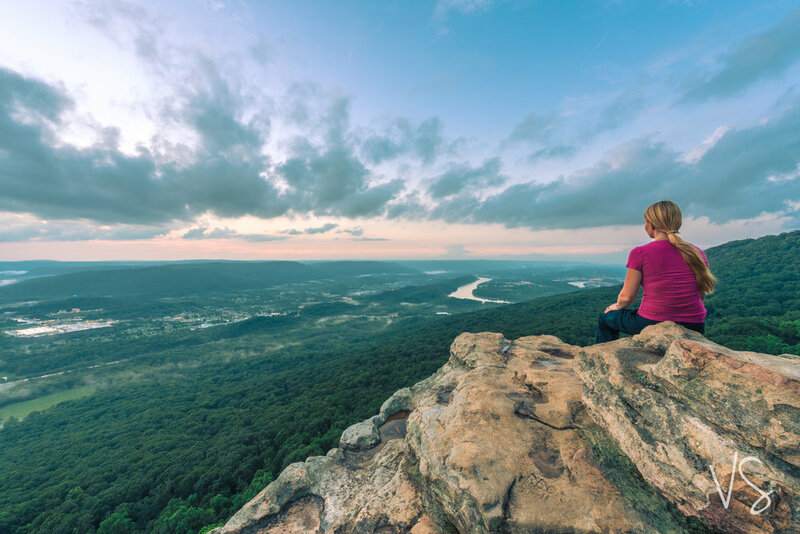 Signal point trail head will give you a beautiful overlook of the TN River and down into Middle Creek. If you go after a rain you may see and hear Julia falls out in the distance to the right. I chose to take the shorter option from Rainbow Lake trailhead which offers a stop at Rainbow Lake. There is a dam that pours into a pool where people often swim. You then have maybe another mile of a hike to get to Rainbow Falls. It’s an 80 foot waterfall that also flows into a pool which leads down the creek. I love challenging hikes and this was the first one on my 30/30 challenge. Adventure 4: Talulah Gorge State Park. This is the farthest I drove out of all of my adventures. I was adventuring with by best waterfall gal and she highly recommended it. We drove nearly 3 hours to get there leaving at 5:30am trying to be one of the first there to get a permit to go in the gorge. They only offer 100 free permits per day and it’s first come first serve. We got there about 30 minutes after the park opened, thanks to Siri taking us in circles and missed getting the permits. The park still had a lot to offer even without going into the gorge. The gorge is 2 miles long and nearly 1,000 feet deep offering spectacular views of the river and waterfalls. The walk to the base of the gorge requires 1062 steps. After 620 steps you are at the suspension bridge which offers some waterfalls underneath you and river overlooks. Once you are at the base of the gorge you are on a deck that overlooks Hurricane falls and the river of the gorge. There is a sign stating to get down in the gorge you must have a permit or else you could get fined. After a 3 hour drive we were all willing to risk the fine and went to play in the gorge. There were natural water slides, rock to jump off of into the natural swimming pools and waterfalls galore. This place is absolutely gorgeous and well worth the drive! Adventure 5: Stringer’s Ridge. 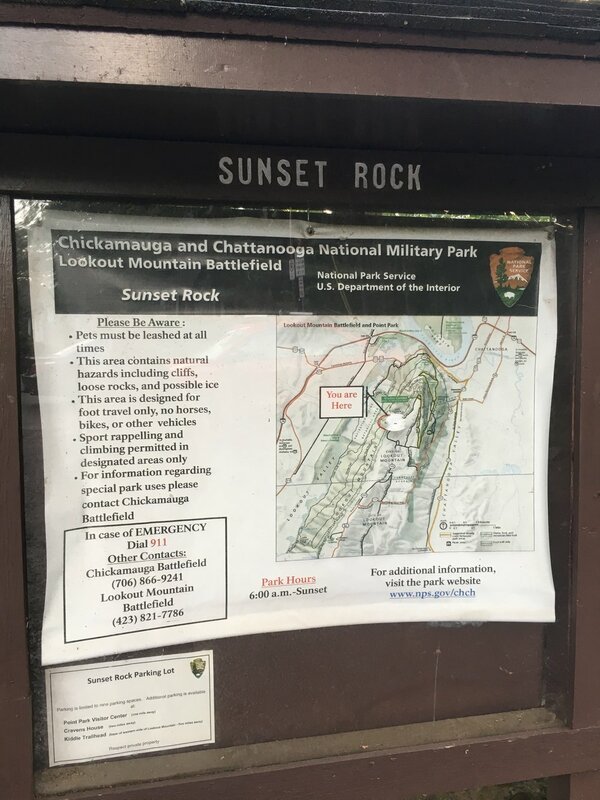 This is a great hiking, trail running, and biking spot in North Chattanooga that features a great overlook of the city, TN River, and Lookout Mountain. It is located right off of Cherokee Blvd on W Bell Ave. The entrance is on the left right after you turn on W Bell Ave. There are several trails from beginner to advanced. 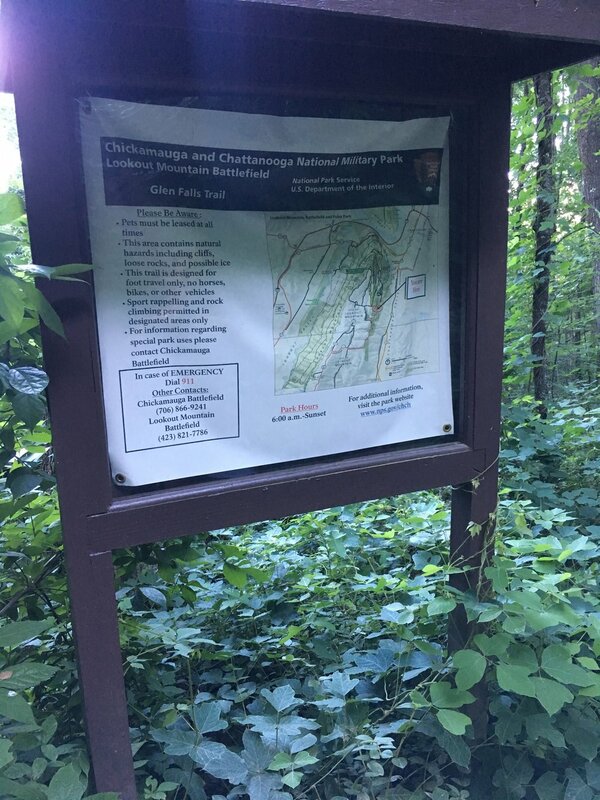 The hike to the overlook is on the Cherokee trail which is an asphalt and gravel mixed trail with a steady easy climb to access the overlook. If you are up or a good workout bring your bikes! Adventure 6: Glen Falls Trail. I had never heard of this trail until I started my adventure challenge and started researching some new trails. I was pleasantly surprised by this hidden gem. If you are headed up Lookout Mountain towards Rock City, there is a pull off to the left about 1 1/2 miles up the mountain. You will see a sign for Glen Falls trailhead. It’s only about .5 miles to the falls and is a very easy and family friendly hike. If you go up above the waterfall you will find a creek with several cascades that are fun to play in. Adventure 7: Suter Falls at South Cumberland State Park. Suter Falls is part of the Savage Gulf State Natural Area only about 45 minutes from Chattanooga. You can hike about a mile in and you will have a view down to some cascades that are just below Suter Falls. Continue walking the path and you will see beautiful Suter falls and a single man suspension bridge. You can continue hiking and will find other waterfalls on this trail however, I chose to just see Suter and head back. As you can see if the photo there are a lot of thin rocks. Do be careful as they are not secure if you walk on them. They are also very sharp. I referred to this waterfall as the place where nothing is attached. Climbing up or down a steep ledge you ideally grab a branch or rock to help you. Not here! Adventure 8: Greeter Falls Loop at South Cumberland State Park. This is a 1.6 mile loop also about 45 minutes outside Chattanooga. This trial features a few waterfalls but it’s main feature is Greeter Falls. There is an Upper Greeter Falls that I always assumed was just a creek but it is actually another waterfall! I don’t see how I missed visiting this the first 2 times because it is literally just a short walk and right above the main falls. The other waterfall is Boardtree Falls and it is a tall cascade. You can also take a short trail to the top of this one for a different view. I’ve taken my dogs on this trail before and they did great other than the metal spiral staircase down to the falls. Adventure 9: Tennessee River Park. I love this place for so many reasons. You can walk, jog, bike, skate, Kayak, or Paddle Board here. It’s 11.5 miles long connect St. Elmo to Downtown Chattanooga to the Chickamauga dam. There are many entry points and you can start your adventure at any of them. The park is open 24/7, has plenty of picnic tables and areas for families. It’s also a great place to watch sunset and watch the Southern Belle go by. You will also see people fishing off the many different piers. Adventure 10: Denny Cove. A 2.8 mile out and back trail also in the South Cumberland State Park. It is the newest addition to the park and features hiking, rock climbing, and a waterfall. There’s a bit of rock scrambling the last 1/4 mile or so before the waterfall. The waterfall is the end of the trail. I managed to go when the waterfall was dry (it was raining on our hike out) but I have seen photos when there’s water and it’s beautiful! Hopefully you enjoyed my first 10 adventures and are inspired to try a new trail or adventure. Stay tuned as I have broken my adventures into 3 parts. Can’t wait? Find me on Facebook www.facebook.com/vsoutdoorsnaps or Instagram @vsoutdoorsnaps and see all of my adventures now!